Order your Arkansas Equine Liability Sign online. 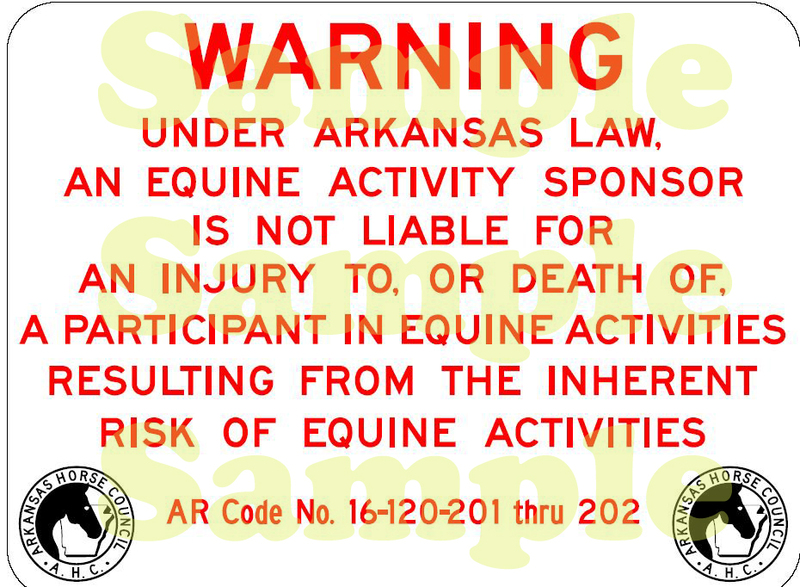 An equine event, business or operation is not covered under the Arkansas Equine Liability Act unless a sign with this text is posted. On the "payment options" page, just above your shipping address, you are asked for your phone number. Our shipper, UPS, requests that we include the recipients phone number on all our shipments, it will only be used in processing this order. These signs are made exclusively for AEF by Interstate Highway Sign Company and are made to the same standards as the signs along the interstate system. They are made of reflective aluminum, white background with black letters, are 24" X 18" and weigh 4 lbs each (they are heavy). The signs should normally arrive within 7-10 days of receiving your order.